When the summer arrives, it’s hard to keep your child at home within the safety of the four walls. One way to help them enjoy the summer months could be by purchasing Razor’s E300s Electric Scooter. It’s a motorized scooter that will help your kids fulfill their need for maximum speed as they race down the roads with their friends. For an electric scooter for adults, see the Segway ES1 eScooter here. As toy companies advance, there are plenty of new toys available out on the market. The problem arises when you need to choose one, and you want to make it a surprise, too. They are hundreds of toys that you can buy for your child to use outside, from quads, to bikes, to cars, to scooters. It can be close to impossible to make a decision between all these options, but Razor managed to make something very unique and original: a motorized scooter. For something a little different, see our review on Razor’s dune buggy! The Razor E300 Electric Scooter has a quiet engine, reliable acceleration control, a 24 volt motorized battery and can speed down the road at up to 15 miles per hour. That’s as fast as Razor’s dirt bike (see the Razor MX350 here), and provides a lot of thrill for any enthusiastic child, adult or teenager that likes spending time outdoors. Try out the Razor Ripstick caster board review if you prefer skateboards. Since motorized scooters are quite a recent development on the scooter market, you may be left wondering what particular features they possess that makes them different from normal scooters. If you are curious about the differences between the two, don’t hesitate to read on! The Razor E300 electric scooter has a 24-volt battery, and can be ridden for up to 45 minutes after battery charging. The charge time recommended for this Razor electric scooter is about 10-12 hours after each use. It’s not advised to leave this scooter overnight or have it charge for over 24 hours since that can do significant damage to the battery. It is also advised to charge the Razor electric scooter after every use, even if you end up riding for less than 45 minutes. This will ensure that the battery is constantly getting its dose of electricity and won’t start dying. One thing to consider is the amount of time you will need to charge this scooter for. 10 hours of charging may seem like too much if you allow your child to use it regularly. After all, everyone has their electricity bills and adding a scooter to the equation probably doesn’t help. If you are worried about how this scooter will affect your monthly bills, we recommend seeking advice from parents who already own the scooter. Many parents say that the toy should only be used during dry days and that usually, they only allow their kids to use their scooter on the weekends or after school. Many parents also report that the scooter tends to run way over 45 minutes of continuous riding after a good charge. It can speed through asphalt courts without a problem, and can easily glide up or down a hill. It’s definitely a good, sturdy, reliable toy that is worth the money if you want to give your child some extra entertainment during their outside adventures. The Razor E300 electric scooter is ideal for kids over 6 years old and can be ridden by both teens and adults alike. The manufacturer states that the product is target at teens and adults, however many parents have testified that younger kids can also easily reach the handlebars and stand on the wide deck. All of the Razor electric scooters have generally versatile age ranges, and that’s why many parents feel safe testing out the products on their younger children. As long as there is a parent or sibling supervising the younger child, there should be no problem in letting the ride the new toy. The scooter supports people that weigh up to 220lbs, which makes it one of the most versatile scooters out on the market today. It’s not often that Razor presents a product that can be used by all family members, but the Razor E300 Scooter can do exactly that. No matter if you have young kids, teenagers, young adults or seniors within your household, everyone can have a bit of fun with the 24-volt motorized ride-on scooter. One thing to consider is to not allow kids younger than 6 to play with the scooter since it’s a rather heavy and giant toy that could easily fall down and crush them if they are not supervised. If you have kids that are above 6 years old that are mature enough to handle this scooter and are big enough to use it comfortably, then there is absolutely no reason as to why they shouldn’t do so! The product itself will arrive in a box that will weigh about 30 pounds. It’s important to find a place to put your scooter before it arrives; it should be kept in a dry place where it won’t be affected by humid or damp weather conditions, since those could damage the battery life and circuiting. When selling older models, Razor USA used to include the tools that you need to use to help you assemble the scooter. That, however, may not be the case with the most recent models, and that’s why we recommend checking if you have certain tools at home. Before you order the scooter, you should make sure that you have the following tools: a 5mm wrench, a 4mm wrench, a Phillips screwdriver, a valve extender and a bicycle-like tire pump. Having these tools will help you assemble the scooter within 10 minutes. Upon the arrival of the scooter, you will find a manual within the box. Within the manual, you will find instructions that will help you assemble the scooter and instructions that will help inform you about any safety hazards and how you should go about using and storing your new purchase. It’s very important that if you are buying the Razor E300 Scooter for a child, to make them aware of how they should take care of the scooter, what they can and can’t do and how they can stay safe when riding it. There are also instructions that specifically tell you how to properly take care not to kill the batteries, which should be thoroughly read by the parents. There are a few things you can do that will ensure the longevity of your new Razor E300 Scooter. First of all, you should make sure that the scooter is turned off when you are not using it. If you have it running when you are not moving along with it, you will kill the batteries much quicker. You should also make sure that you don’t store your scooter in very low temperatures (garages are probably a bad idea) since that can also kill the battery. You should also take care to not exhaust your scooter each time you ride; leave some battery charge before charging it again, this will ensure the battery life lasts longer. If you feel like your scooter is not going as fast as it should, we also recommend loosening the rear brake tension with the hand operated rear brake, since that has happened to help many people drastically increase the maximum speed of their Razor electric scooters. The deck of the E300 scooter is relatively wide and should allow any adult and teenager to comfortably stand on it when gliding. The frame of the scooter is also significantly bigger than it was on the previous line of scooters made by Razor USA. Its 10 inch extra wide pneumatic tires allow it to go up to a maximum speed of 15 miles per hour and the speed can be easily controlled by the break located at the front of the handlebars. There is also a retractable kickstand that allows you to stop anywhere, anytime, without having to lay your scooter on the floors, exposing it to damage. The scooters battery system consists of two 12v sealed lead acid rechargeable batteries; these allow your Razor E300 Scooter to remain conspicuous when it speeds past houses and parks. Thanks to the quiet chain driven motor system you will be able to ride past your neighborhood without bothering your neighbors in the slightest. 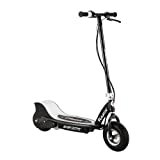 This scooter from Razor is ideal for trips to and from grocery stores, neighborhood errands or friend meet-ups or just evening glides in the breeze. Razor E300 Electric Scooter is ideal for the whole family. If you have kids that are aged above 6 years old, you can be sure that they will love this motorized scooter. It can be used by teenagers, adults and kids alike, which makes it one of the most versatile scooter on the Razor market. The Razor E300 Electric Scooter is ideal for adults and teens who want to glide around their neighborhoods. Whether you will be using the scooter for running errands or just having fun, the scooter is ideal for doing both. The extra wide, comfortable larger deck allows the child or adult riders to stand and ride around the neighborhood without any trouble. Check out the Razor E200 Electric Scooter as an alternative. 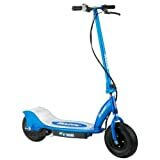 If you are looking for another scooter that you can use during your quick trips around your neighborhood, we can fully recommend the Razor E300S seated Electric Scooter. The seat is of course detachable, and you can ride the Razor E300S Scooter for up to 40 minutes of continuous riding before recharging. It’s recommended for kids above 12 years of age.